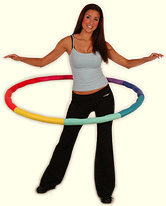 ohh i tried hula hooping long time back and I dont seem to get the swing of it.. what could I be doing wrong? hey Doli, the light ones are useless in terms of fitness.. get the heavy, bulky ones. They stay up better too. LOL, Dipali!! After two workouts yesterday, I am black and blue! :-) You don’t want to be me! oooh,sounds like a “fun”way to get back that elusive waistline of mine back…need to find it before my reunion in Aug! oooh,sounds like a “fun”way to get back that elusive waistline of mine…need to find it before my reunion in Aug! Chooch: Go for it! Its fun. and LOL-ing at your last line. Don’t you know about wanting what you don’t have? Hula? Oh you and The Mad One are two peas in a pod! You should try this out Deej. I’m upto 10 minutes either way.. in great pain somedays, but boy, you see results!